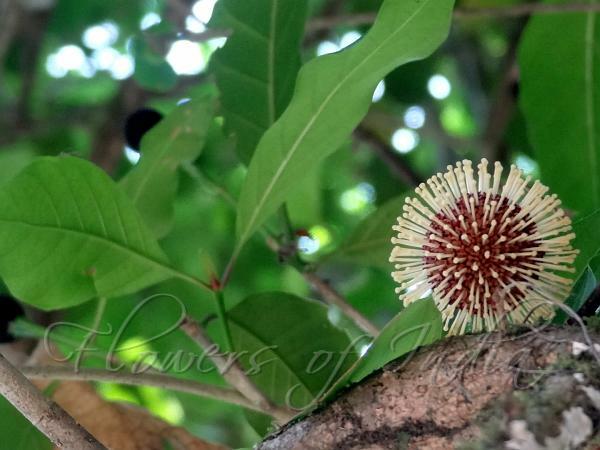 Purple Neo-Cheesewood is a small tree, up to 15 m tall, bark greyish-brown, peeling in small irregular flakes, blaze creamy-yellow. Leaves are simple, opposite, decussate, stipules interpetiolar, entire, flat, deciduous, stalks 1-2 cm, stout, hairless. Leaves are 10-17.5 x 4-7.3 cm, elliptic or elliptic-lanceolate, base narrowing into the stalk, tip pointed or long-pointed. Leaves have entire margin, are hairless and papery. Lateral nerves are 6-8 pairs, pinnate, prominent. Flowers are bisexual, purple, 1.2 cm long, stalkless, borne in spherical heads 4 cm across, in leaf axils or at branch ends, mixed with many bracteoles. Sepal tube is angular, sepals 5, hispid. Flower tube is 8 mm long, funnel shaped, glabrous, petals 5, obovate, obtuse, imbricate; stamens 5, included, attached to the throat of corolla; anthers oblong, apiculate; ovary 2-celled, inferior, ovules many in each cell, pendulous; style 15 mm long, thickened; stigma globose. Fruit is a globose receptacle bearing capsule, 5 x 3 mm, obovoid, truncate, hispid above; seeds many, flat, winged, bifid at the tip. 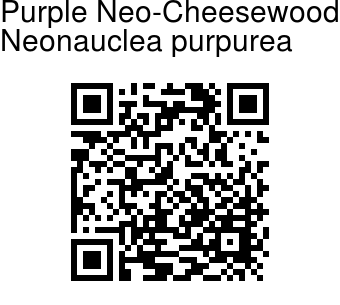 Purple Neo-Cheesewood is found in Indo-Malaysia, Asia Pacific and Australia, and the Western Ghats- occasional in South and Central Sahyadris. Identification credit: Siddarth Machado Photographed in Sakleshpur Taluk, Hassan, Karnataka.